A bit early, but it is the 4th of July with spectacular night shows. "Everything you need to know: Perseid meteor shower"
In the Northern Hemisphere, the annual August Perseid meteor shower probably ranks as the all-time favorite meteor shower of the year. This major shower takes place during the lazy, hazy days of summer, when many families are on vacation. And what could be more luxurious than taking a siesta in the heat of the day and watching this summertime classic in the relative coolness of night? This shower is visible in the Southern Hemisphere, too, though to a lesser extent. No matter where you live worldwide, the 2013 Perseid meteor shower will probably be at its best on the nights of August 11-12 and/or August 12-13. Try the nights before and after that, too. Before dawn viewing is best. From northerly latitudes, you often see 50 or more meteors per hour, and from southerly latitudes in the Southern Hemisphere, perhaps you’ll see about one-third that many meteors. When is the best time to view the Perseid meteor shower? Don’t wait until the peak nights to watch for the Perseid meteors. You can start watching a week or more before the peak nights of August 11-12 and 12-13, assuming you have a dark sky. The Perseid shower is known to rise gradually to a peak, then fall off rapidly afterwards. 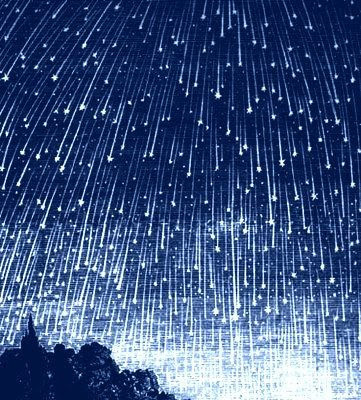 So as the nights pass in the week before the shower, the meteors will increase in number. As a general rule, the Perseid meteors tend to be few and far between at early evening. Yet, if fortune smiles upon you, you could catch an earthgrazer – a looooong, slow, colorful meteor traveling horizontally across the evening sky. Earthgrazer meteors are rare but most exciting and memorable, if you happen to spot one. Perseid earthgrazers can only appear at early to mid-evening, when the radiant point of the shower is close to the horizon. As evening deepens into late night, and the meteor shower radiant climbs higher in the sky, more and more Perseid meteors streak the nighttime. The meteors don’t really start to pick up steam until after midnight, and usually don’t bombard the sky most abundantly until the wee hours before dawn. You may see 50 or so meteors per hour in a dark sky. How to watch the Perseid meteor shower. You need no special equipment to enjoy this nighttime spectacle. You don’t even have to know the constellations. But you’ll definitely want to find a dark, open sky to fully enjoy the show. It also helps to be a night owl. Give yourself at least an hour of observing time, for these meteors in meteor showers come in spurts and are interspersed with lulls. An open sky is essential because these meteors fly across the sky in many different directions and in front of numerous constellations. If you trace the paths of the Perseid meteors backward, you’d find they come from a point in front of the constellation Perseus. But once again, you don’t need to know Perseus or any other constellation to watch this or any meteor shower. But once again, you don’t need to know the constellation Perseus to enjoy the Perseid meteor shower. Enjoy the comfort of a reclining lawn chair and look upward in a dark sky far away from pesky artificial lights. Give yourself at least an hour of observing time as meteors oftentimes come in spurts and are interspersed by lulls. What’s the source of the Perseid meteor shower? Every year, from around July 17 to August 24, our planet Earth crosses the orbital path of Comet Swift-Tuttle, the parent of the Perseid meteor shower. Debris from this comet litters the comet’s orbit, but we don’t really get into the thick of the comet rubble until after the first week of August. The bits and pieces from Comet Swift-Tuttle slam into the Earth’s upper atmosphere at some 210,000 kilometers (130,000 miles) per hour, lighting up the nighttime with fast-moving Perseid meteors. If our planet happens to pass through an unusually dense clump of meteoroids – comet rubble – we’ll see an elevated number of meteors. We can always hope! Comet Swift-Tuttle has a very eccentric – oblong – orbit that takes this comet outside the orbit of Pluto when farthest from the sun, and inside the Earth’s orbit when closest to the sun. It orbits the sun in a period of about 133 years. Every time this comet passes through the inner solar system, the sun warms and softens up the ices in the comet, causing it to release fresh comet material into its orbital stream. Comet Swift-Tuttle last reached perihelion – closest point to the sun – in December 1992 and will do so next in July 2126. Although the Perseid meteor shower gives us one of the more reliable productions of the year, the ins and outs of any meteor shower cannot be known with absolute certainty. Forecasting the time and intensity of any meteor shower’s peak – or multiple peaks – is akin to predicting the outcome of a sporting event. There’s always the possibility of a surprise and uncertainty. Depending on the year, the shower can exceed, or fall shy, of expectation. The swift-moving and often bright Perseid meteors frequently leave persistent trains – ionized gas trails lasting for a few moments after the meteor has already gone. Watch for these meteors to streak the nighttime in front of the age-old, lore-laden constellations from late night until dawn for the next several nights. The Perseids should put out a few dozen meteors per hour in the wee hours before dawn. Why is this shower called the Perseids? If you trace all the Perseid meteors backward, they all seem to come from the constellation Perseus, near the famous Double Cluster. Hence, the meteor shower is named in the honor of the constellation Perseus the Hero. However, this is a chance alignment of the meteor shower radiant with the constellation Perseus. The stars in Perseus are light-years distant while these meteors burn up about 100 kilometers (60 miles) above the Earth’s surface. If any meteor survives its fiery plunge to hit the ground intact, the remaining portion is called a meteorite. Few – if any – meteors in meteor showers become meteorites, however, because of the flimsy nature of comet degris. Most meteorites are the remains of asteroids. In our day and age of expanded artificial lighting, fewer and fewer people have actually seen the wonders of an inky black night sky. Why not make a date with the Perseid meteor shower this year and witness one of nature’s most remarkable sky shows? Simply find a dark, open sky, enjoy the comfort of a reclining lawn chair and make a night of it! Bottom line: No matter where you live worldwide, the 2013 Perseid meteor shower will probably be at its best on the nights of August 11-12 and/or August 12-13. Before dawn viewing is best. From northerly latitudes, you often see 50 or more meteors per hour, and from southerly latitudes in the Southern Hemisphere, perhaps you’ll see about one-third that many meteors.